Venus makes its rare journey across the sun. Skywatcher Tamas Ladanyi of The World at Night captured this image from Veszprém, Hungary on June 6. 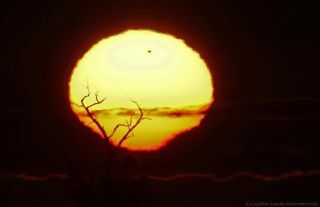 Venus makes its rare transit across a melting sun in this amazing image captured at sunset by a veteran photographer. Astrophotographer Tamas Ladanyi of The World at Night took this photo of the 2012 Venus transit from Veszprém, Hungary on June 6 local time. “Favorable weather conditions allowed the observation of the rare celestial event,” Ladanyi said. The 2012 transit was viewed by people from North America, Europe, Asia and eastern Africa. Several organizations also provided footage of the event.